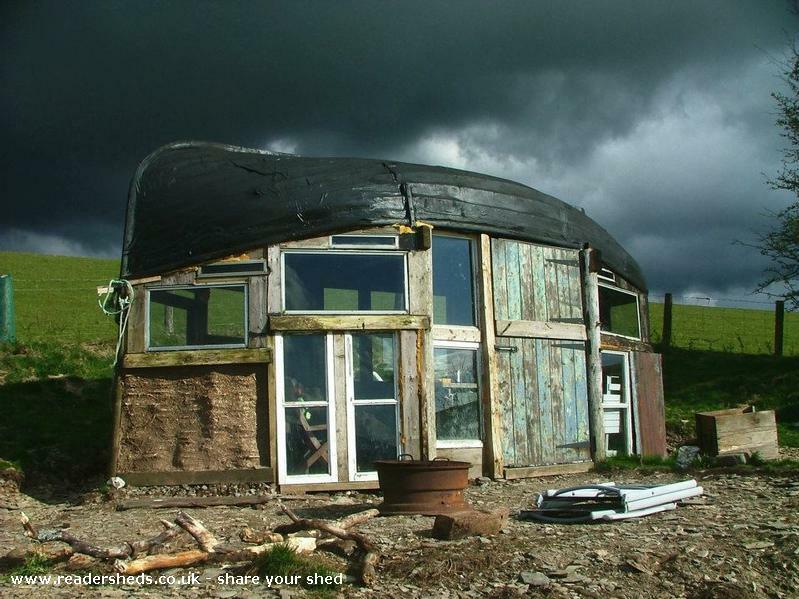 The roof is an upturned boat! 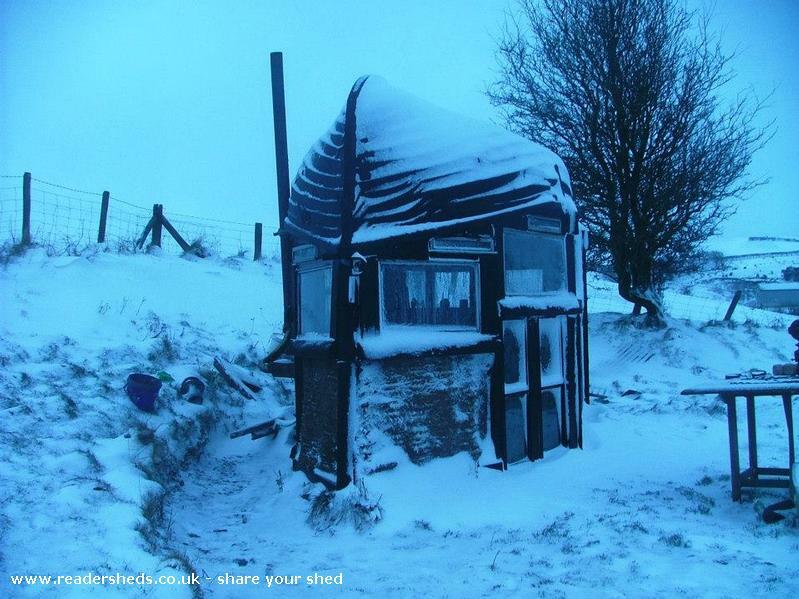 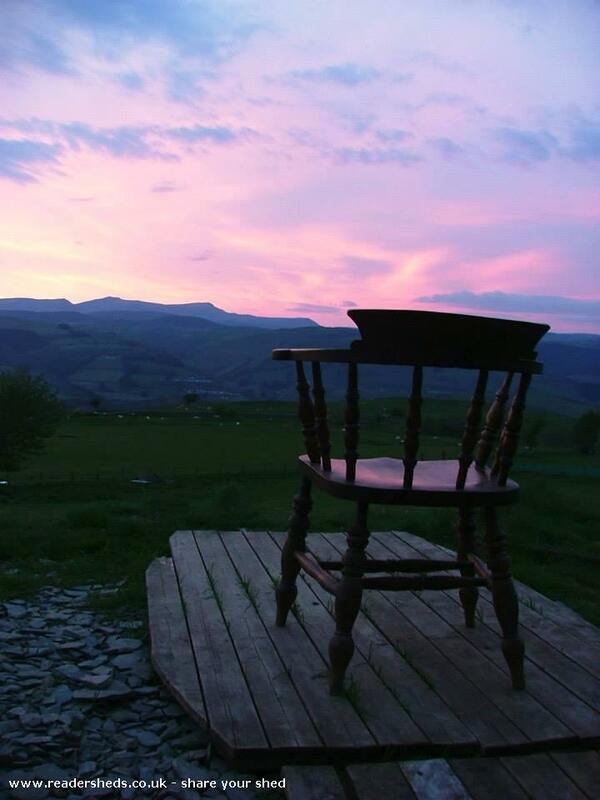 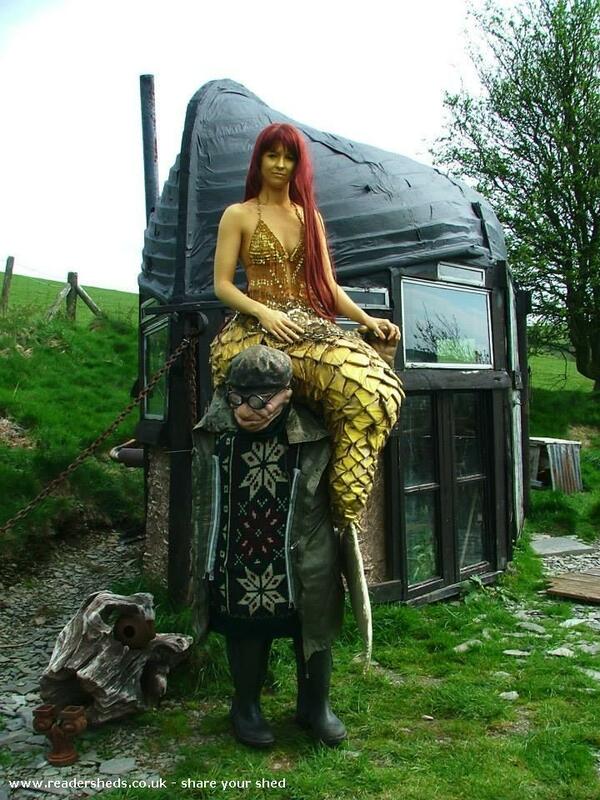 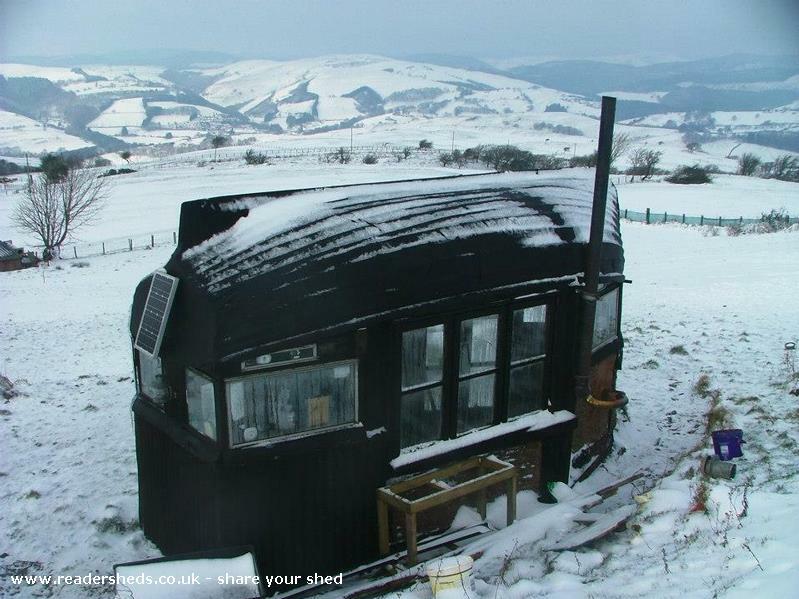 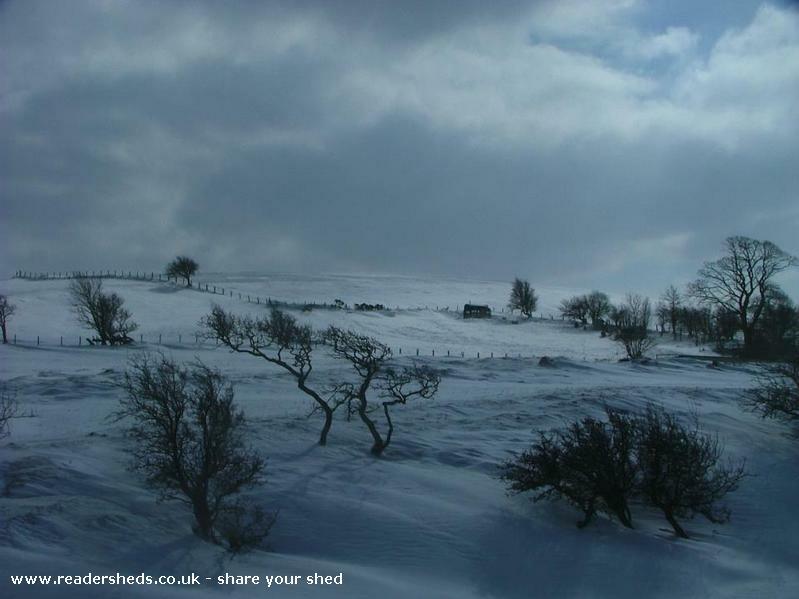 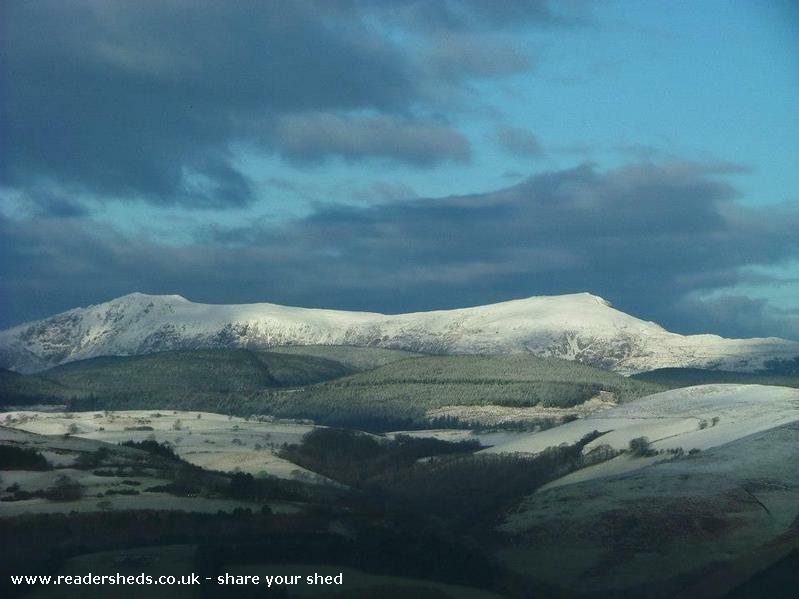 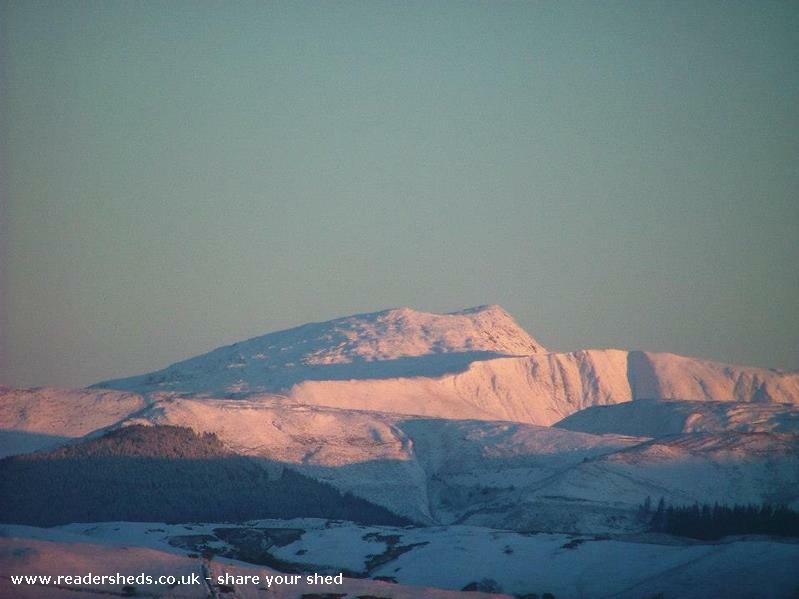 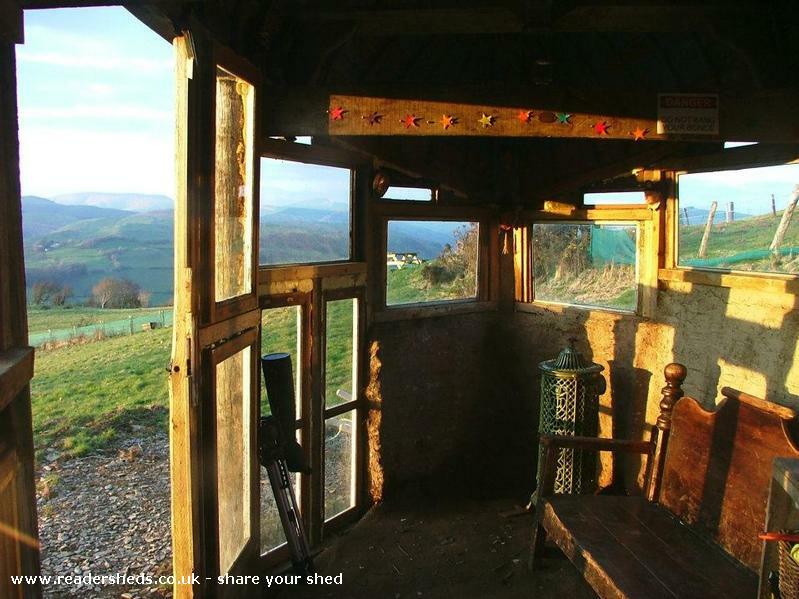 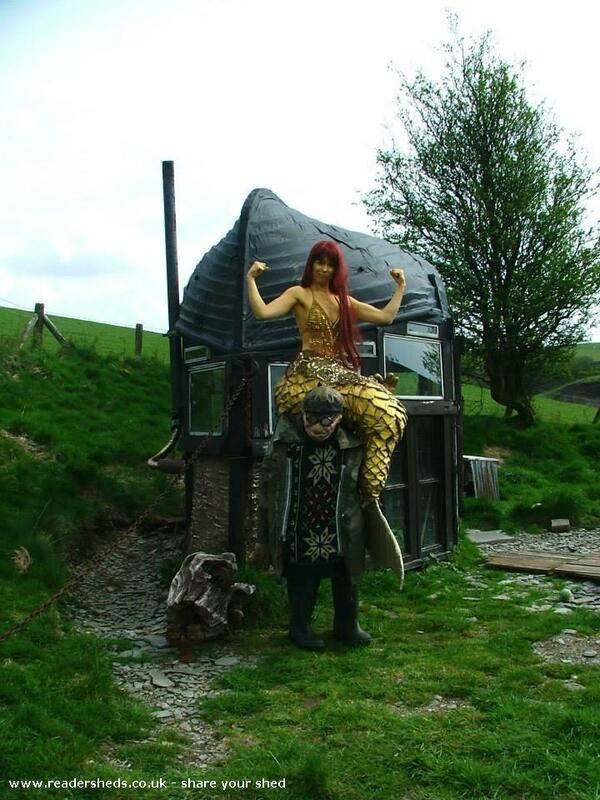 It is located at an altitude of 750ft above sea level in the Cambrian Mountain range near Machynlleth in mid Wales. 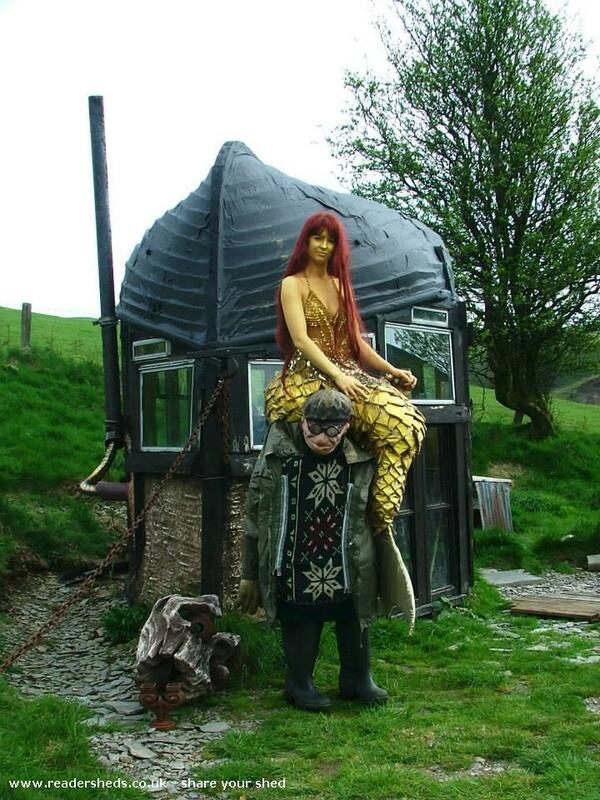 It is full of nautical nonsense befitting a boat turned upside down up a mountain! 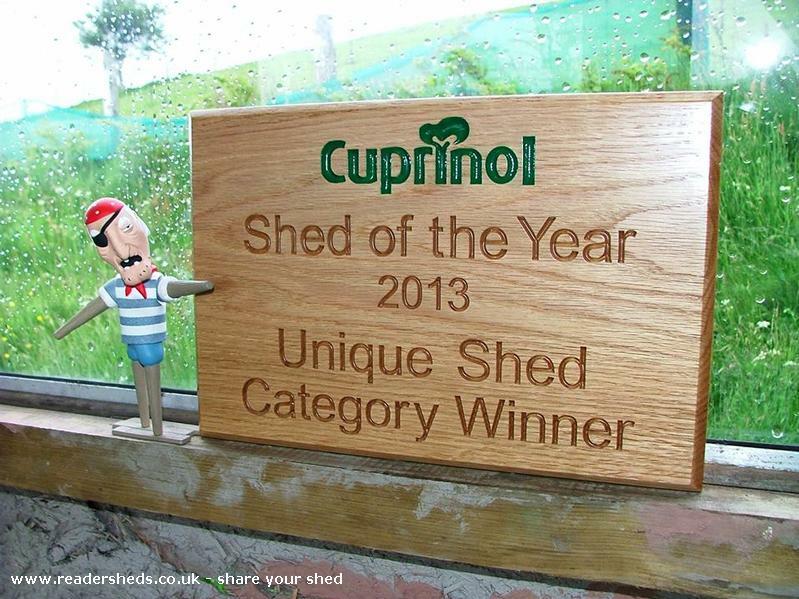 It has a 20w solar panel trickle feeding a leisure battery which powers 3 pairs of ultra-brite L.E.D. 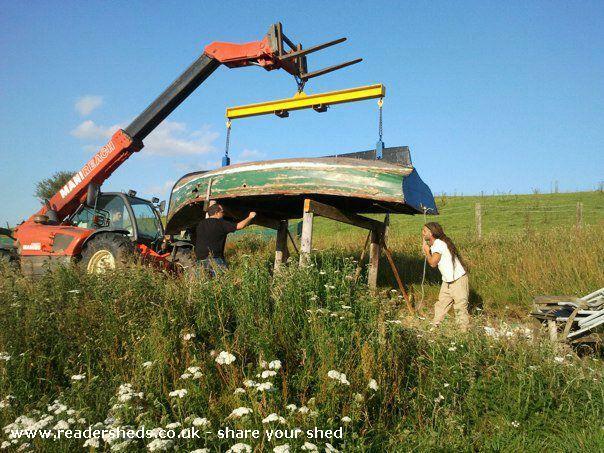 lights and a 12v sound system. 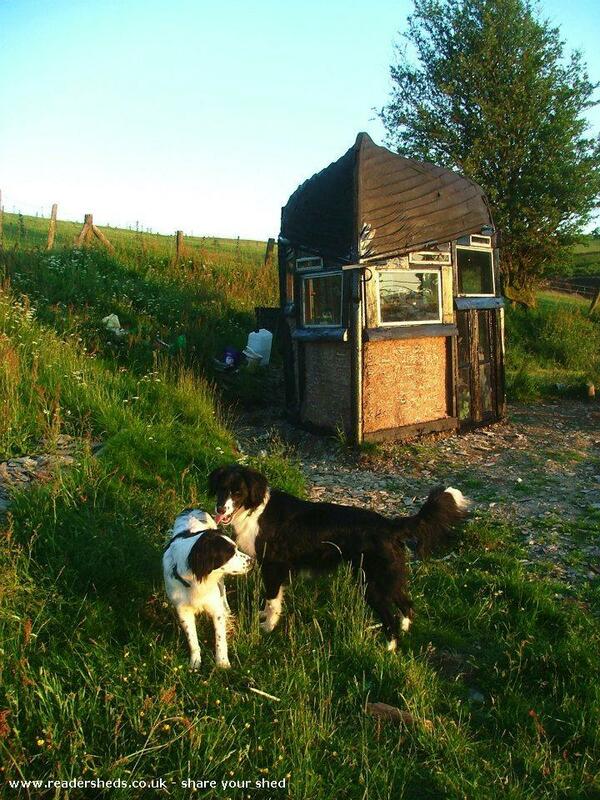 There is a 12v/gas refrigerator and a bottled gas cooker with 2 burners, a grill, and an oven. 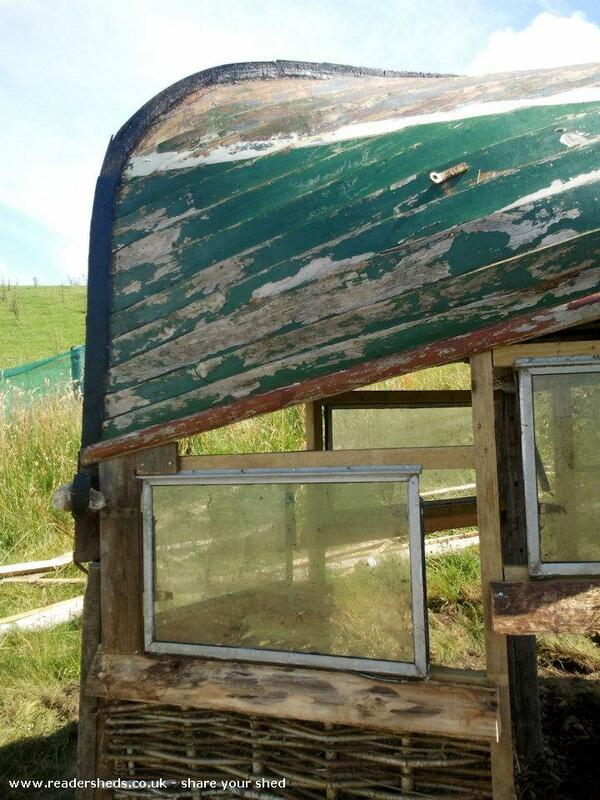 Also has a small 'Belfast sink' plumbed in. 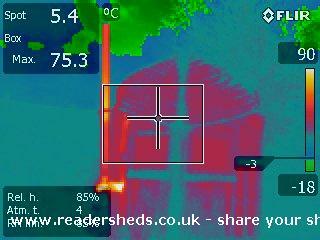 It is heated by a 19th century French enamel wood burning stove. 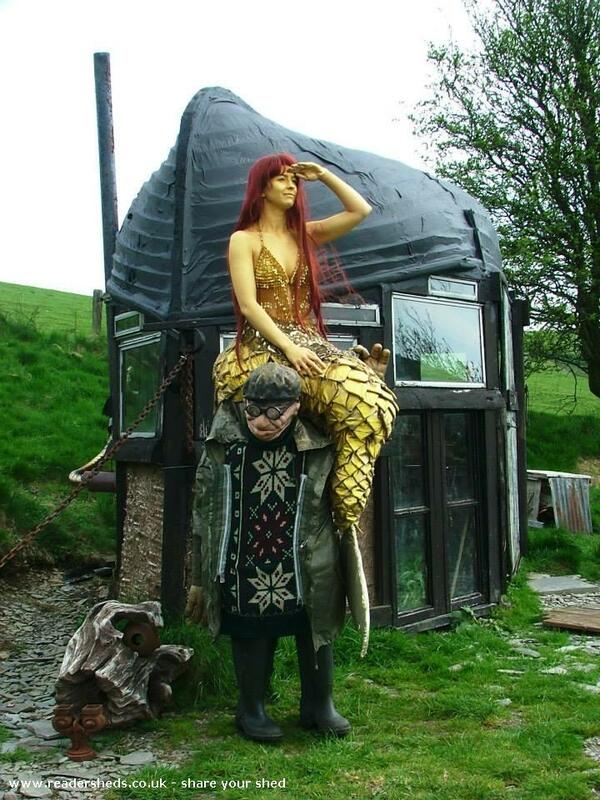 The chimney is an old queen pole from a circus big top that used to house elephants know as 'The elephant shed'! 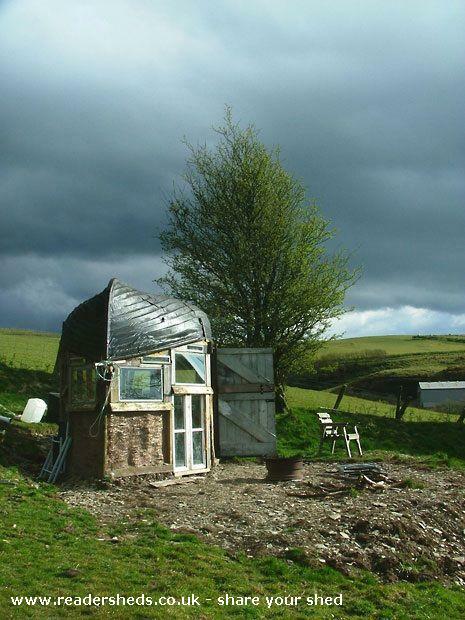 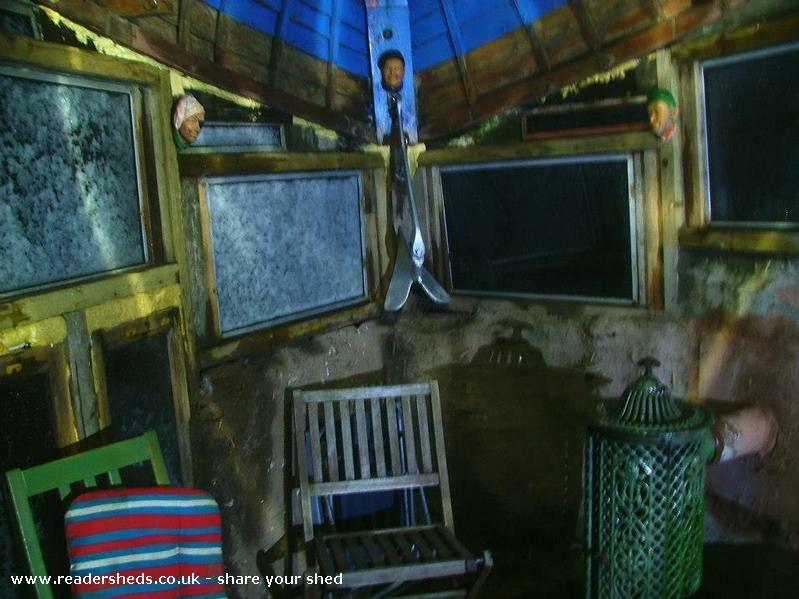 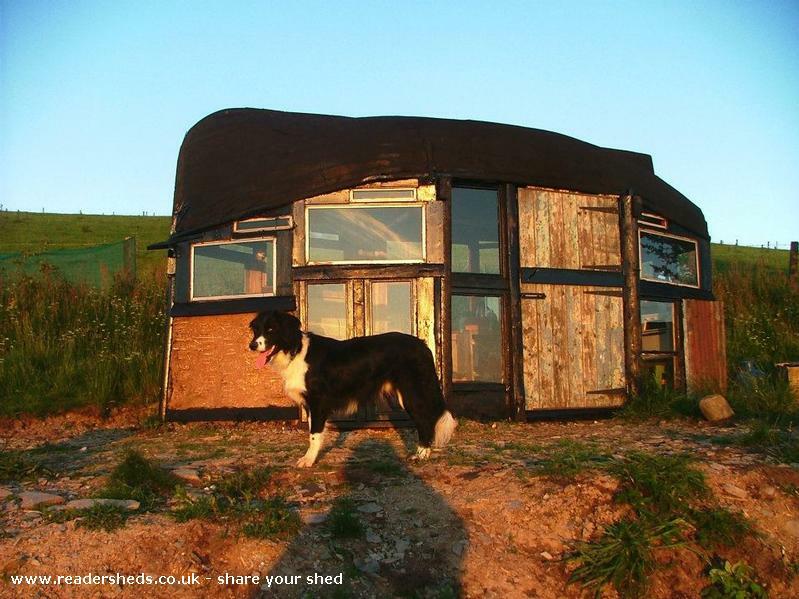 The shed is made completely from recycled materials except for the 12v system. 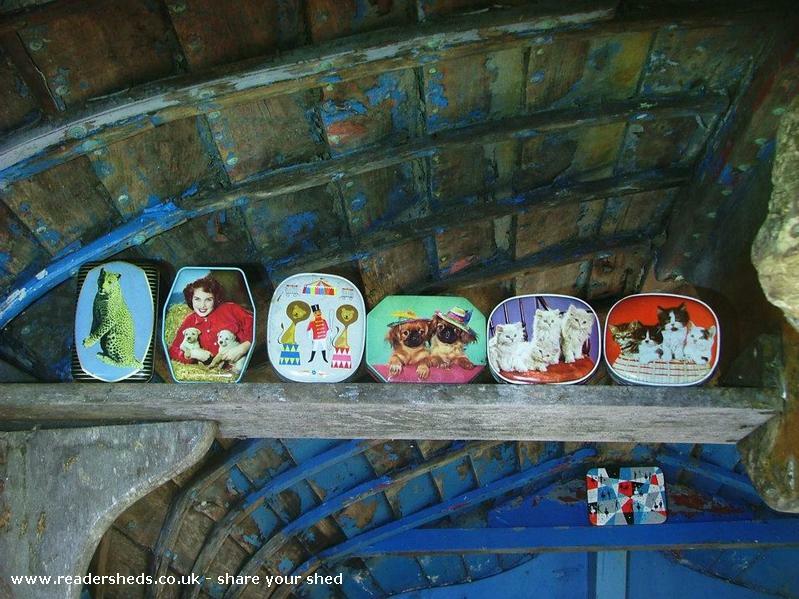 3 sets of chimes from inside mantelpiece clocks have been screwed into the centre board of the boat and you can play them with a big nail! 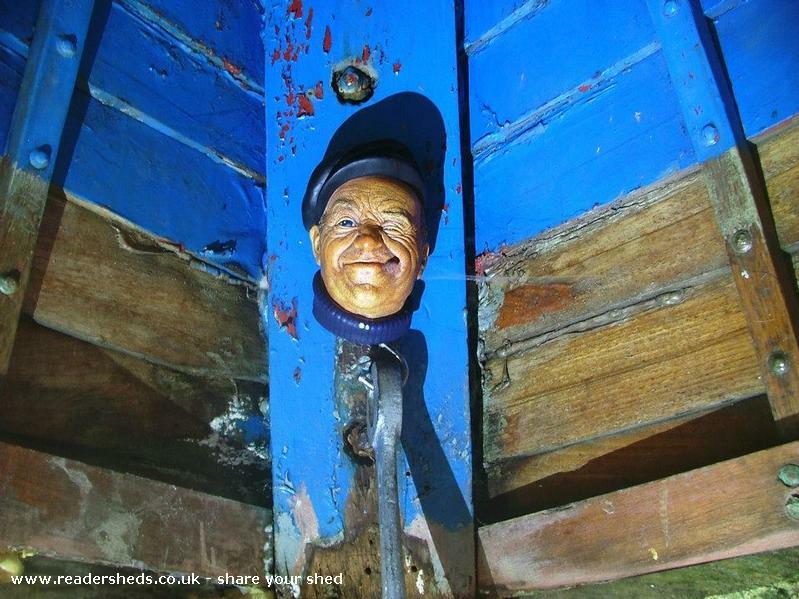 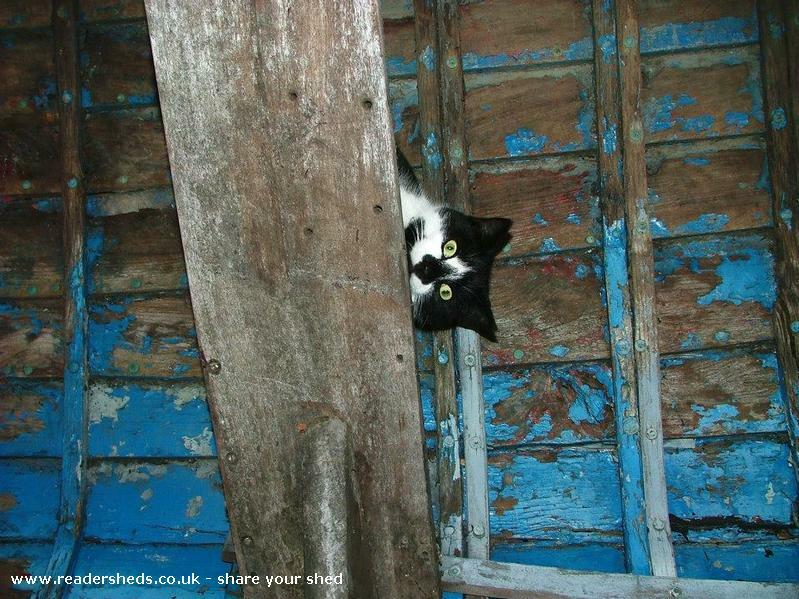 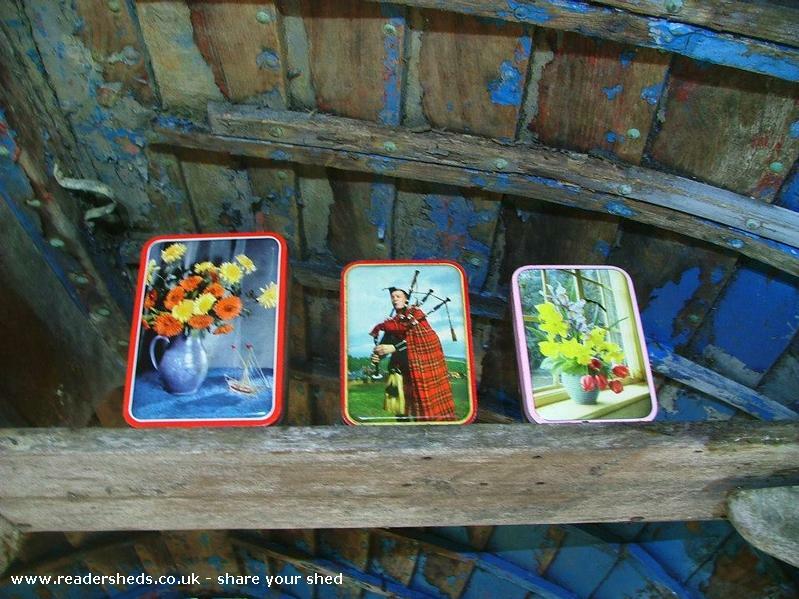 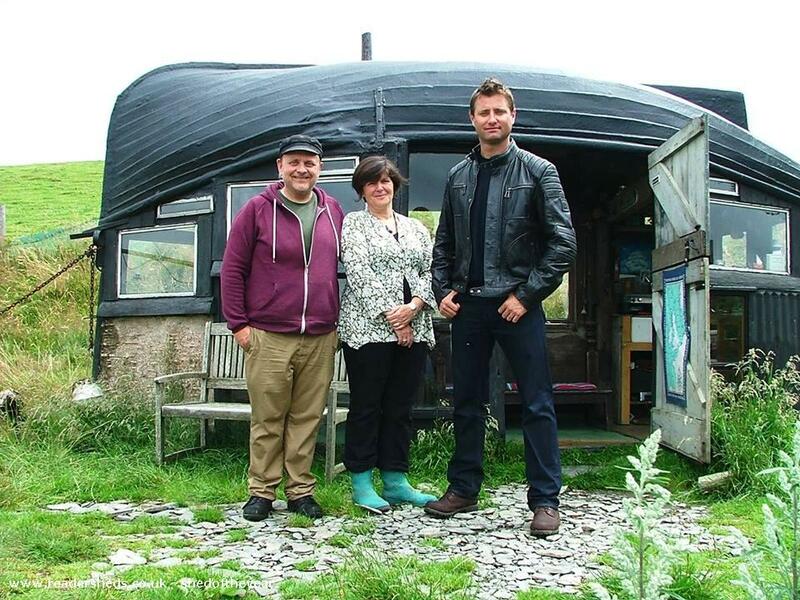 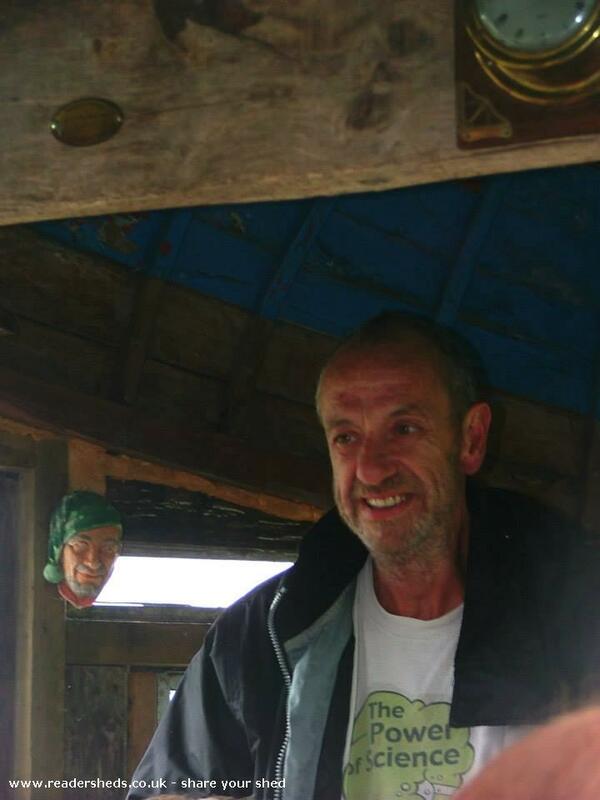 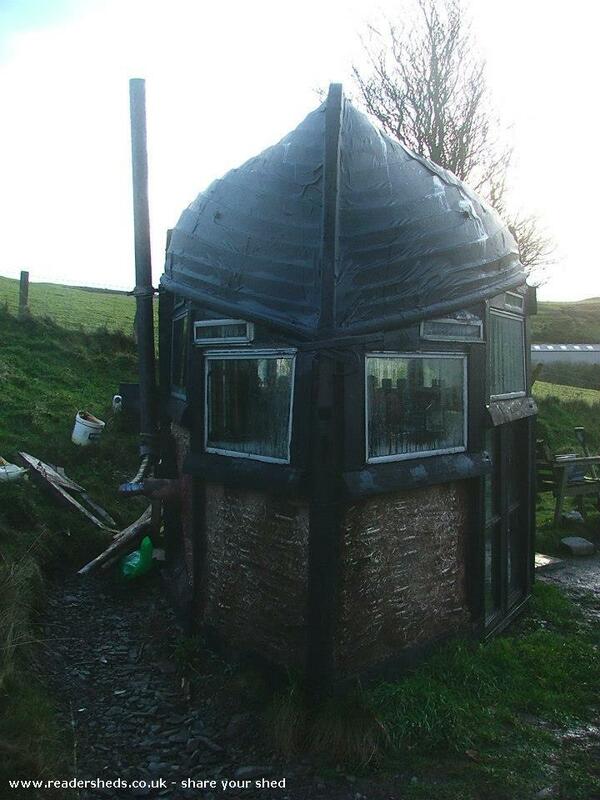 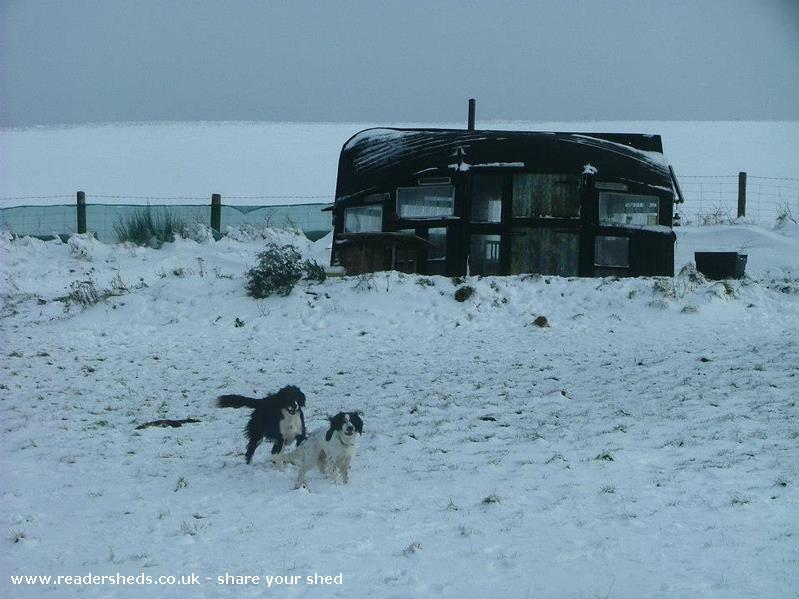 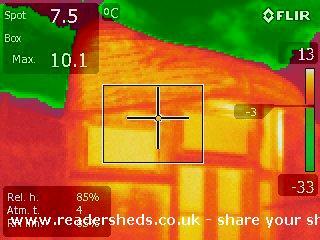 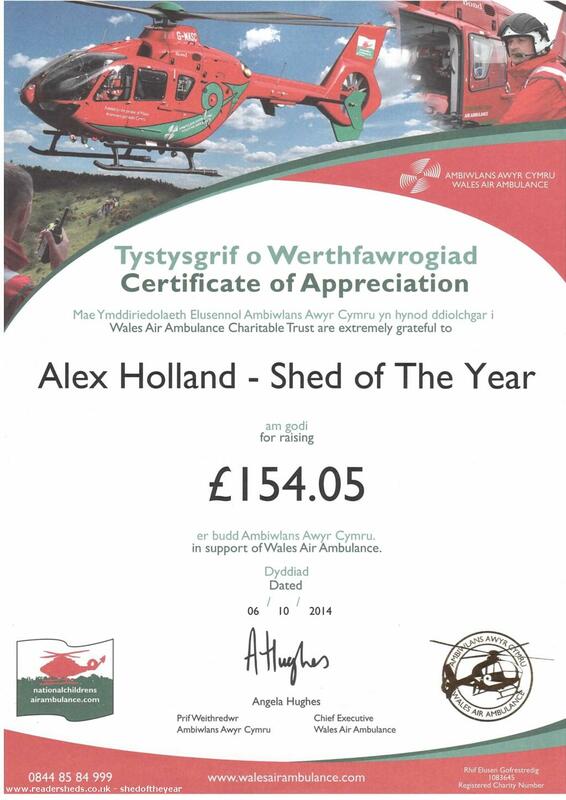 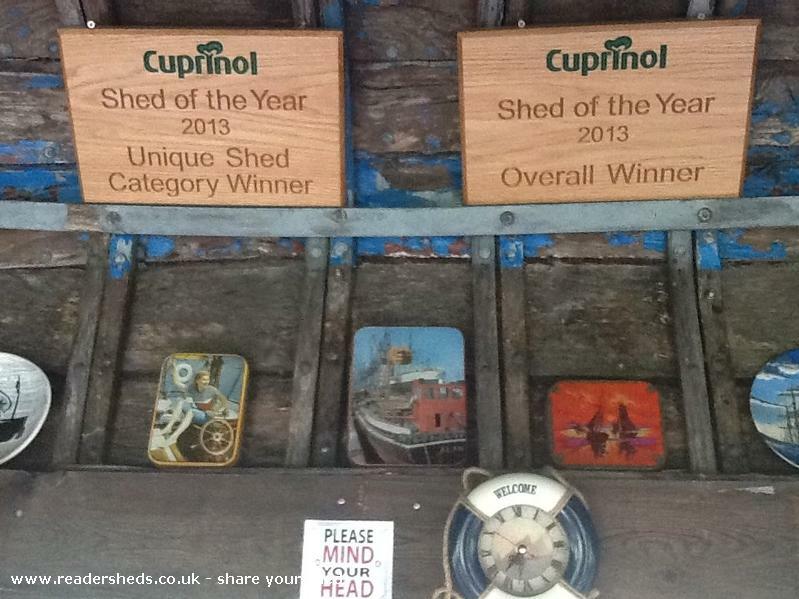 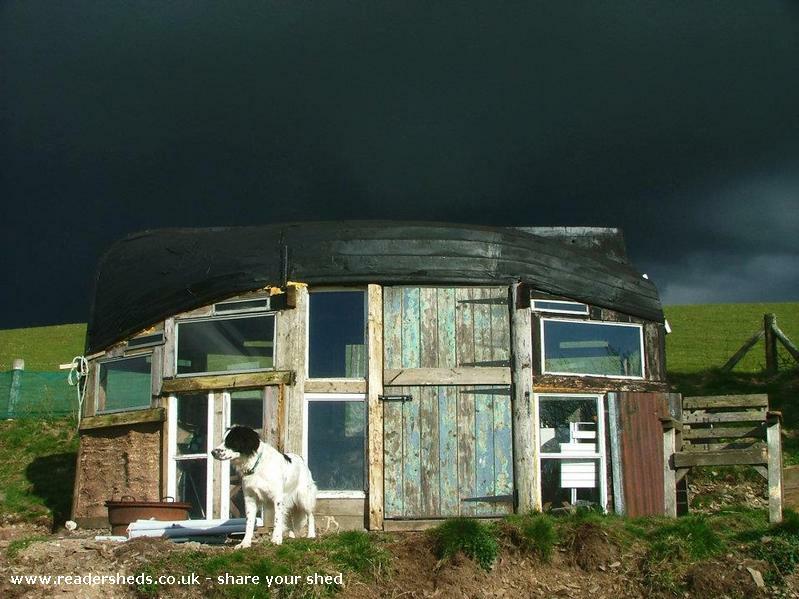 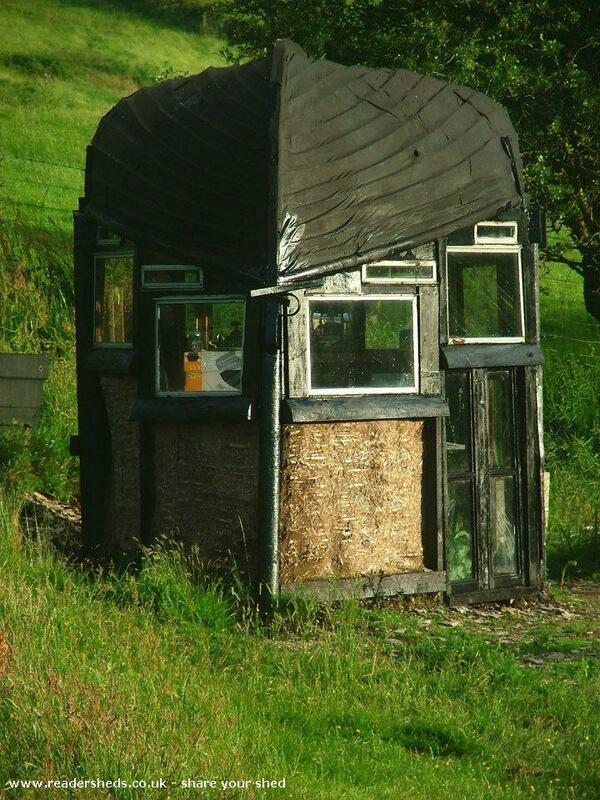 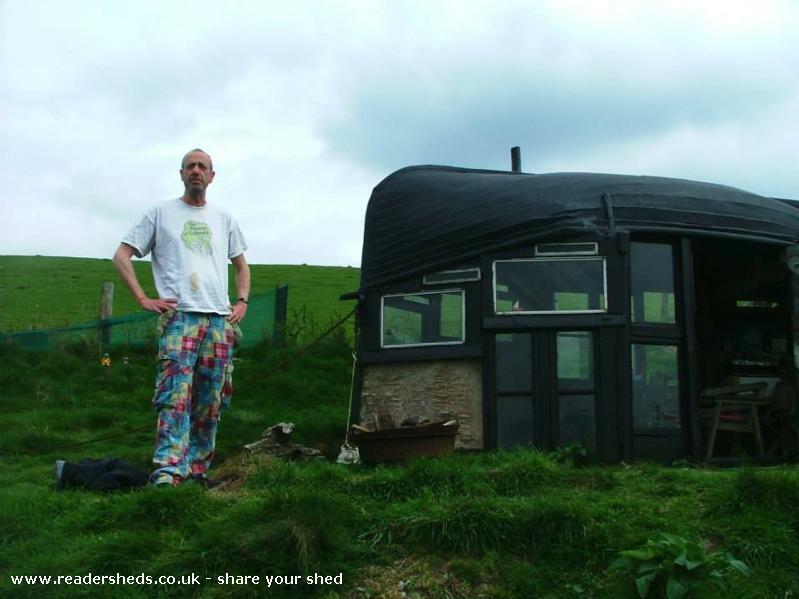 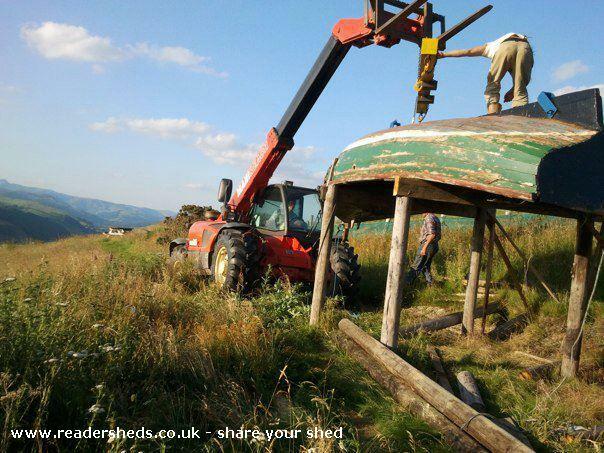 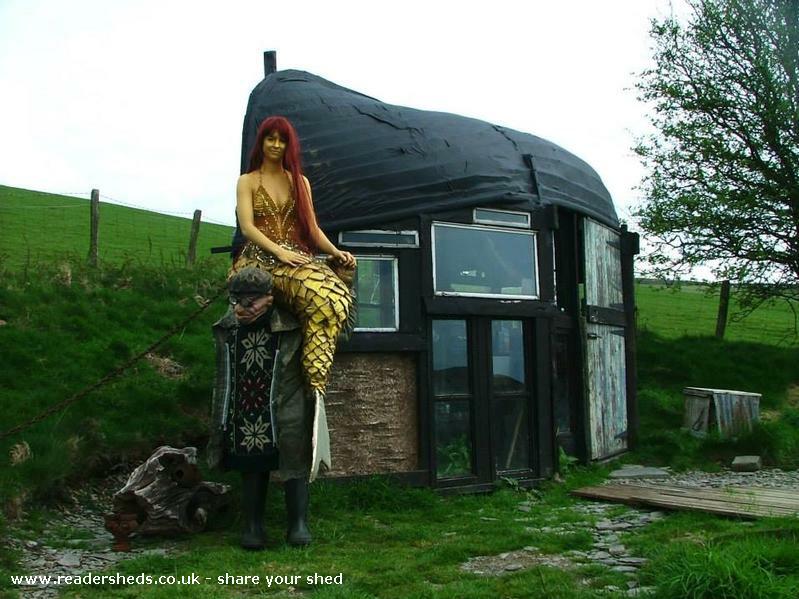 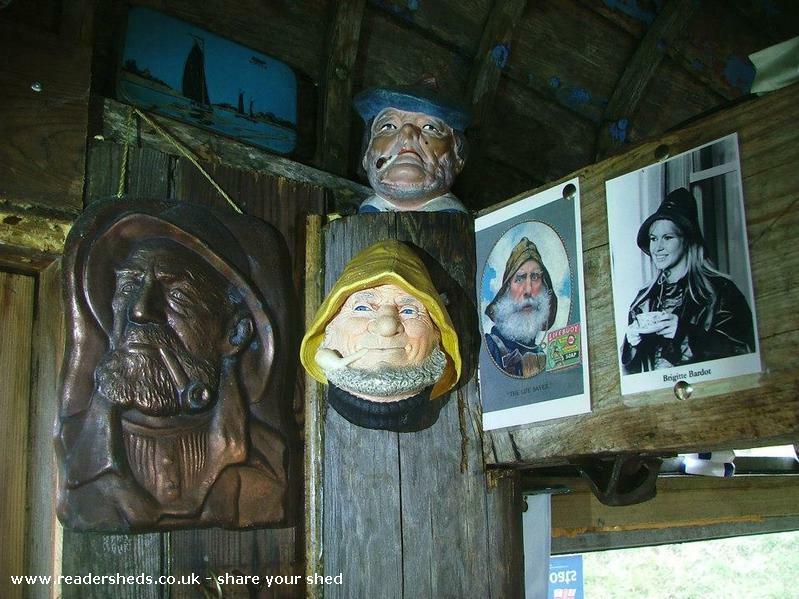 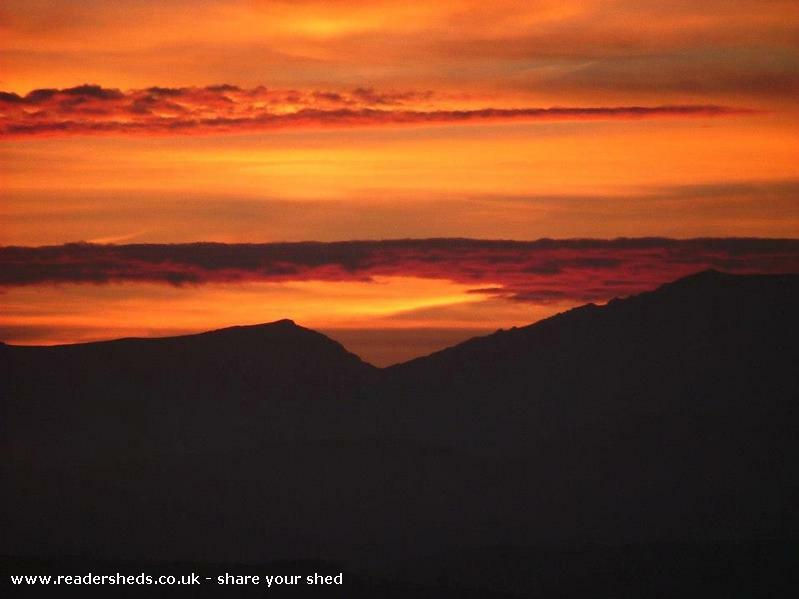 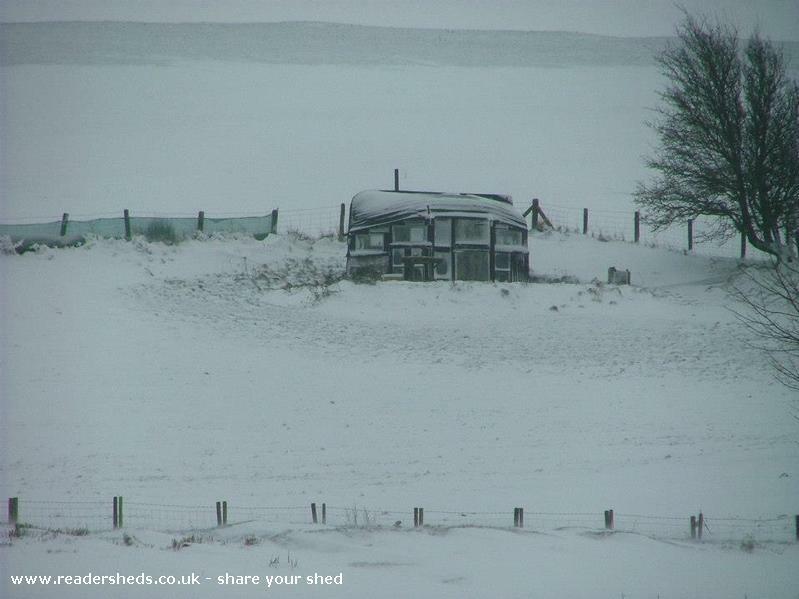 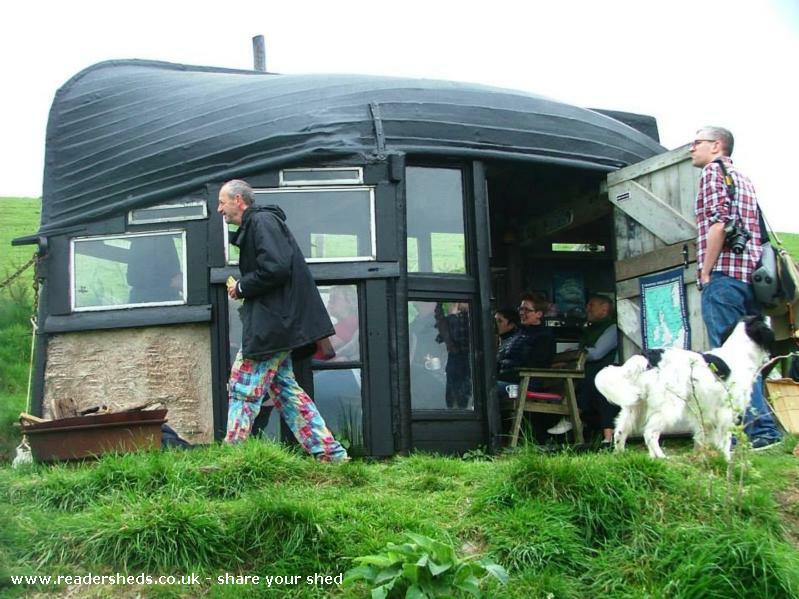 The shed roof is made from a clinker built boat that is 14ft long and 7ft wide at its widest point. 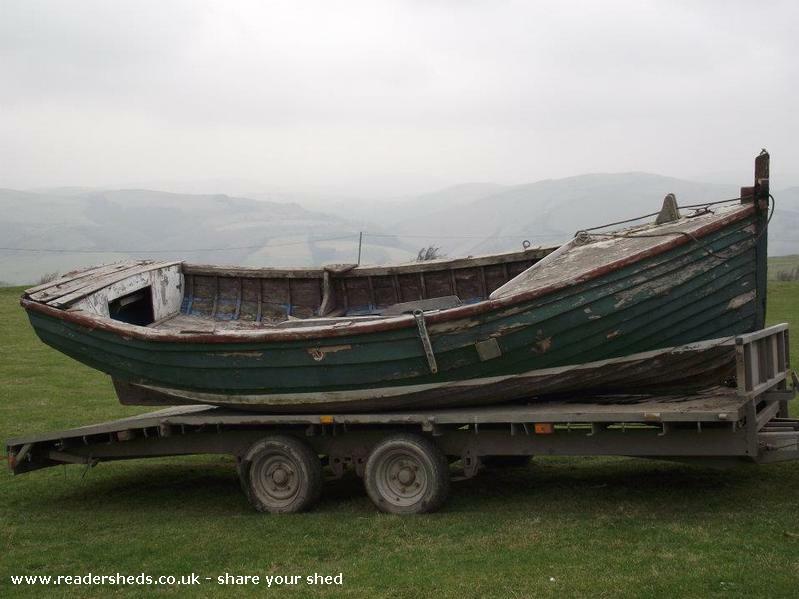 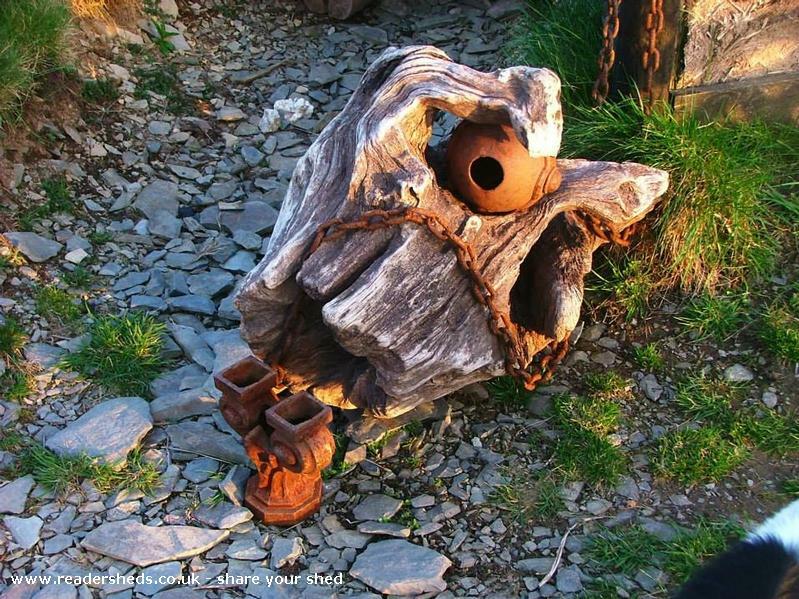 It was an inshore fishing boat made between 1900 and 1910 from Cardigan Bay. 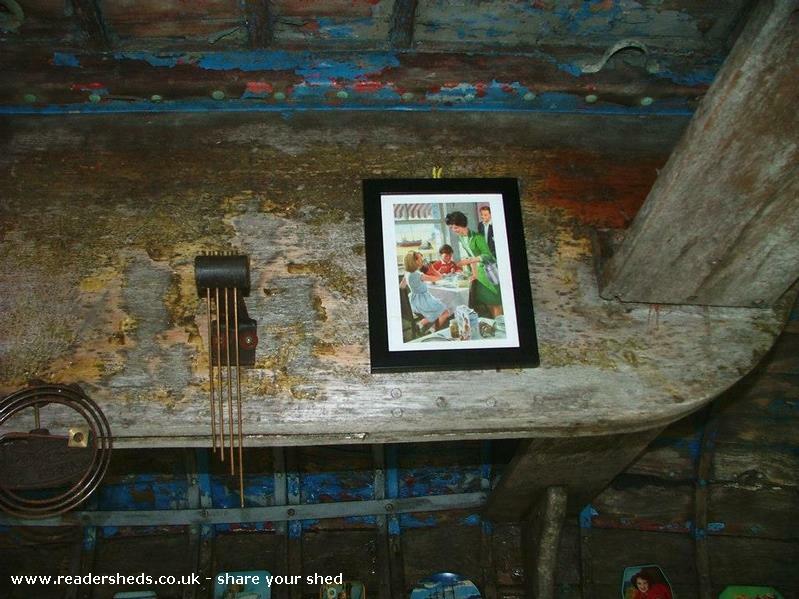 It was placed on a frame of 4 telegraph poles with cross beams. 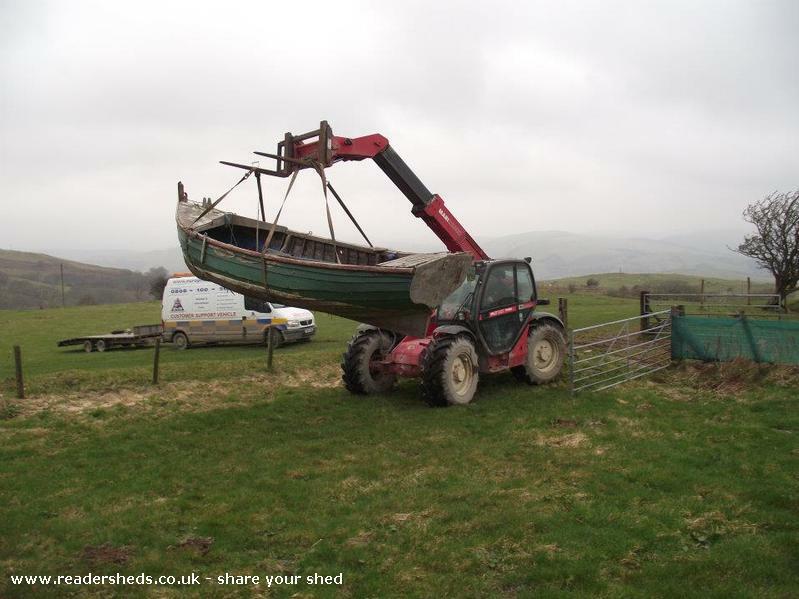 Once in place (and the boat survived!) 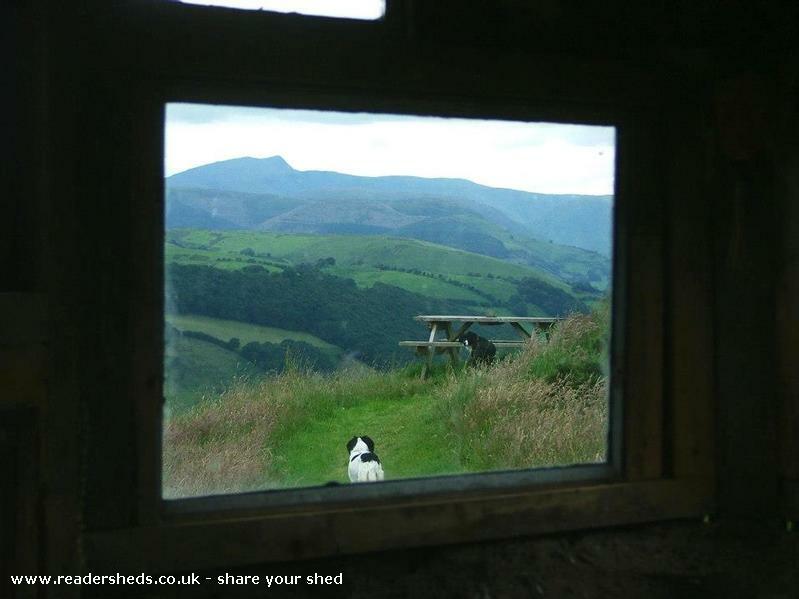 the walls were filled in using aluminium framed windows from a 1940s caravan and single glazed windows from our 400 year old farm house. 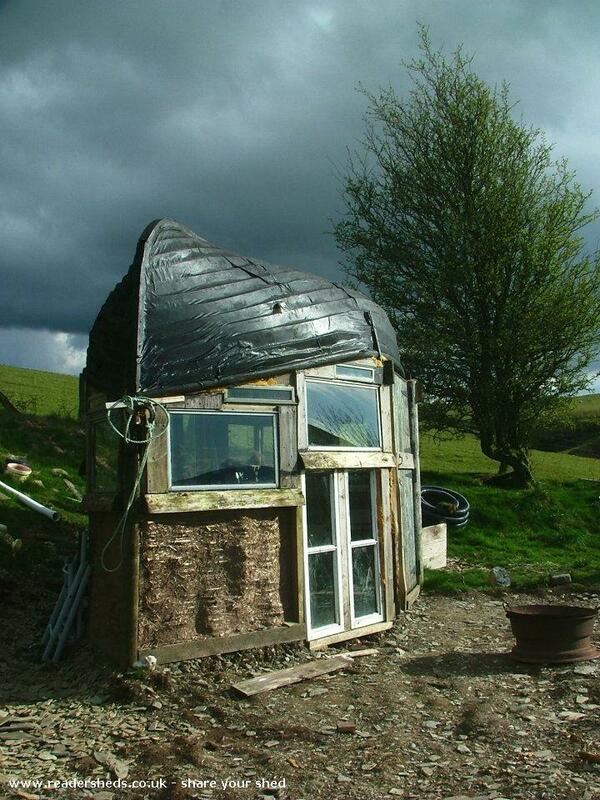 Other walls are made of wattle and daub, a mixture of mud, clay, and straw stuck onto a woven frame. 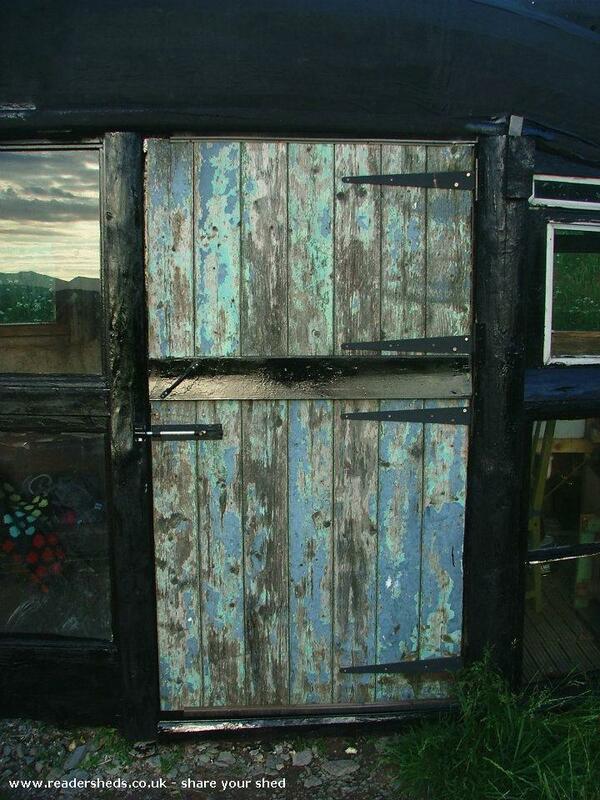 The rear of the shed is clad in old corrugated metal sheet painted in black bitumen. 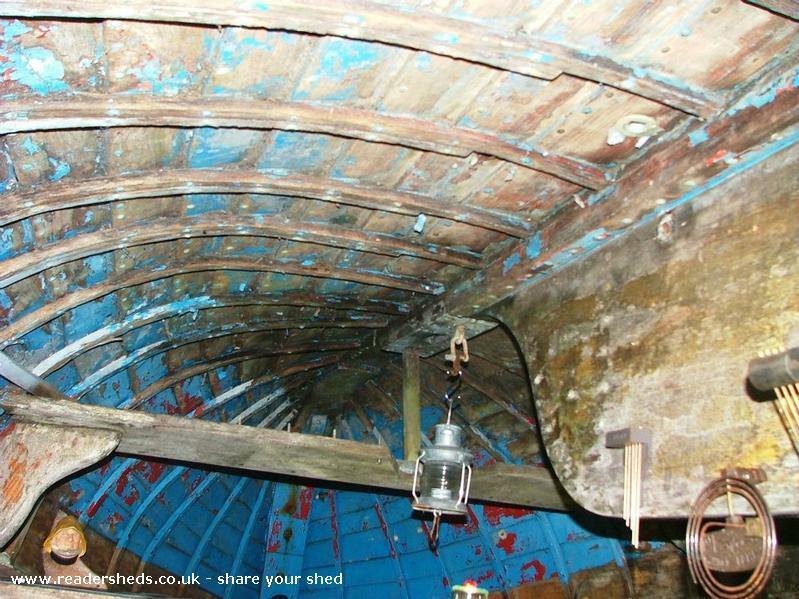 The roof (boat) is covered with sheeting stuck down with roofing felt adhesive and liberally dosed in bitumen paint and roofing paint. 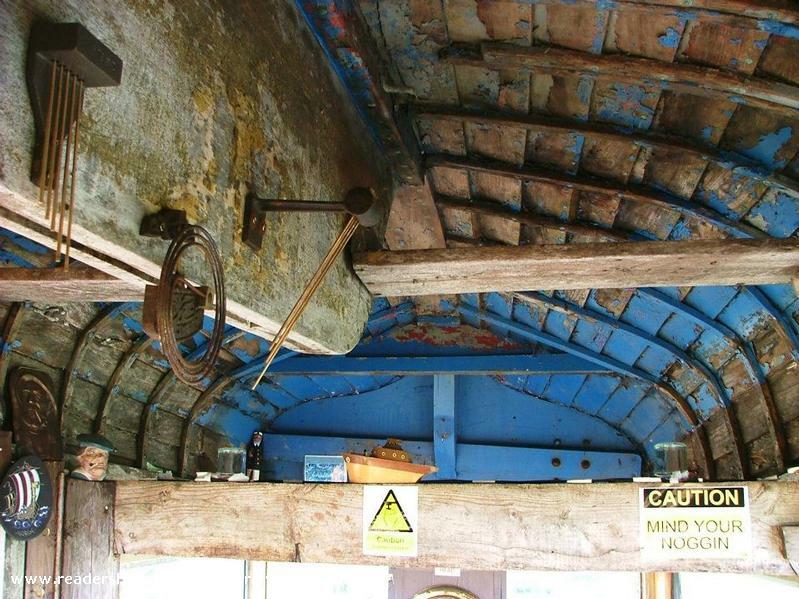 This is because clinker built boats retain their waterproof-ness by the wood expanding due to wetness. 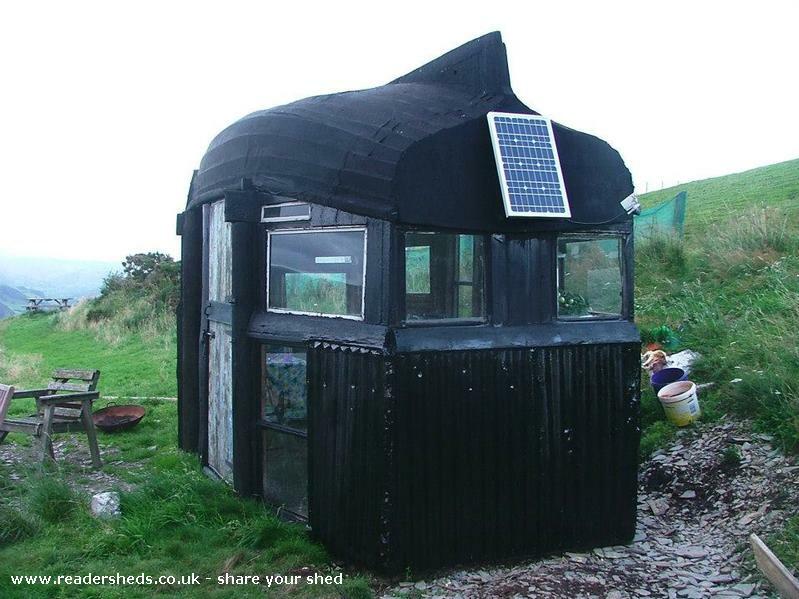 We have discovered that the shed is an ideal space for middle aged women to get drunk and dance wildly under the stars and we intend to pursue this policy! 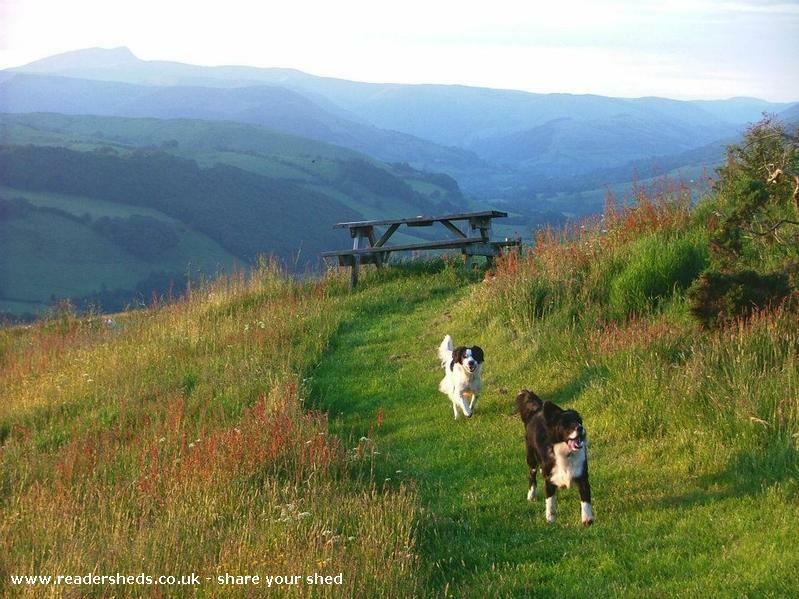 It is also an ideal place for me to sit whilst our 3 dogs run around our field exercising themselves.